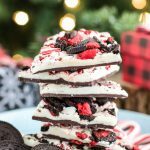 Easy 4-ingredient Oreo Peppermint Bark Recipe. Over a double boiler melt semi-sweet chocolate. Pour over a parchment paper covered baking sheet. Spread with spatula into an even layer. Chill for 15 minutes. Melt white chocolate in a separate bowl and spread on top of cold semi-sweet chocolate. Immediately sprinkle crushed candy canes and chopped Oreos over chocolate. Refrigerate for 15 minutes; cut into squares.